The size of a small bedroom. 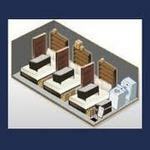 This size unit should hold the contents of a one- bedroom apartment with a refrigerator, washer and dryer. Large Bedroom. 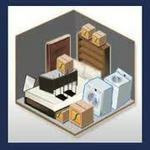 This size should hold the contents of a two-bedroom apartment or small house. The size of a one car garage. This size should hold the contents of a three or four bedroom house. Extra large garage. 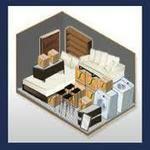 This unit should hold the furnishings of a four to five bedroom house. 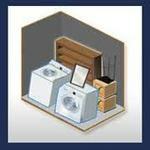 Open storage may be used for parking RV's, Boats, Vehicle's, Trailers and other vehicle types. Covered RV, Boat, Vehicle or other storage space. Covered storage for RV, Boat, Vehicle or other storage. Each unit has 120 Volt power that may be used only for charging batteries.